Anyone who has ever stepped on a piece of Lego with their bare feet, cursing under their breath, will know that when you have kids, toys are everywhere. Literally. In our house, we are slowly but surely drowning in toys. 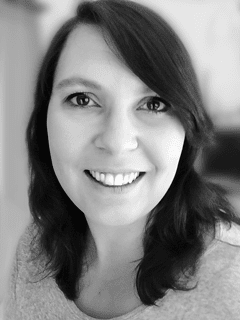 Even though I try to stay on top of it as best as I can, parting with unused toys as the kids outgrow them, nearly every room contains various Barbies, Legos, drawing kits, fancy dress costumes, musical toys and so on – and then some. 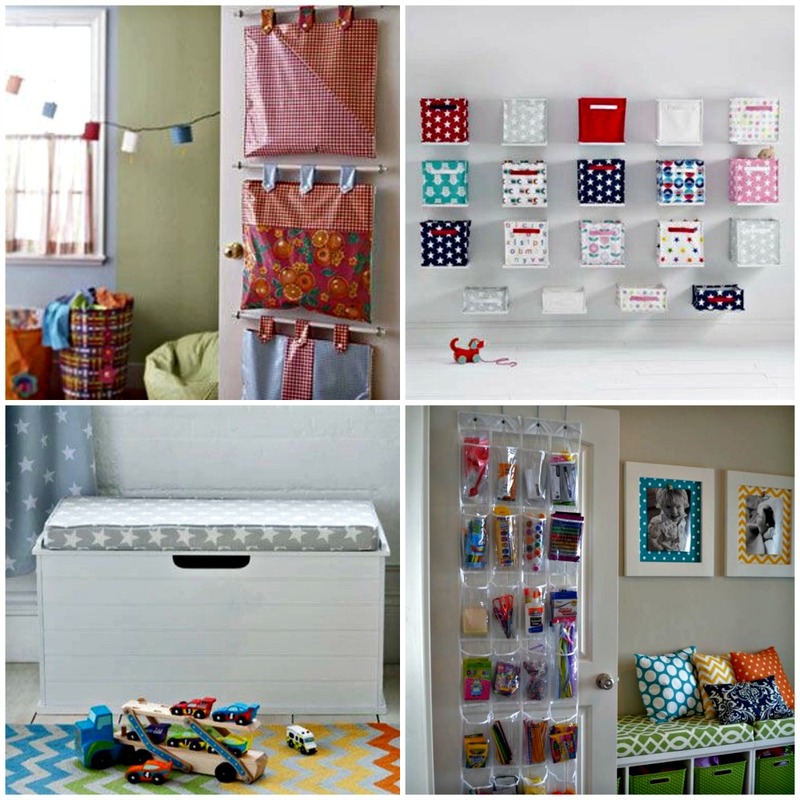 So I’ve been looking for some toy storage ideas that are clever as well as stylish to easily put away some of the kids’ stuff, as well as helping them to learn to be a bit more tidy and that everything has its place. 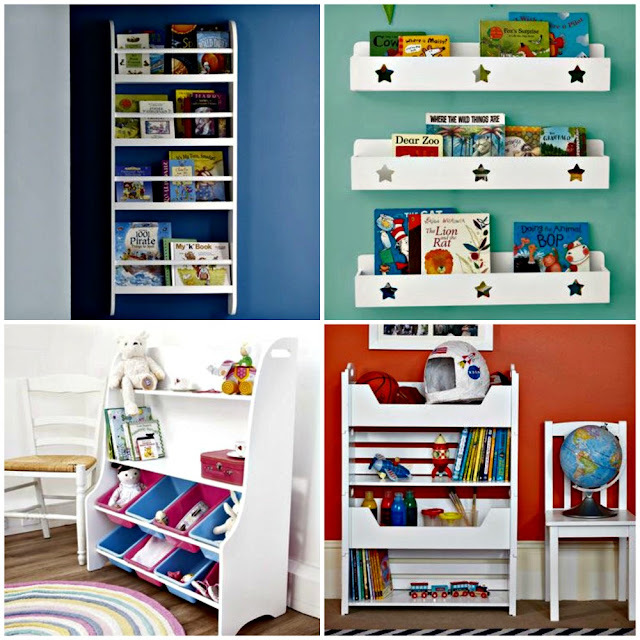 I love the little ladder shelves (top picture). I think if we ever move or reconfigure our home, these will definitely be on my wish list, as they just look so cute, while also pretty and child friendly. I love how the hallway has been used with this clever and space saving shelving and vintage crate. How ingenious is this? 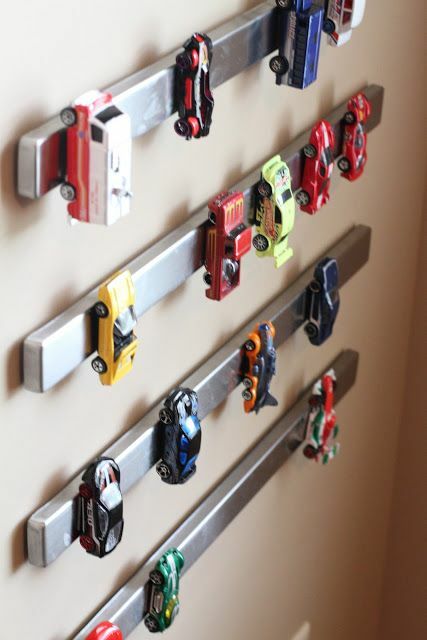 Toy cars on a magnetic strip - tidy while also making for a nice display. Good old Ikea to the rescue. I don't know many households who don't have one of these shelve units in their house - they certainly can store away a hell of a lot of books, games and Legos! 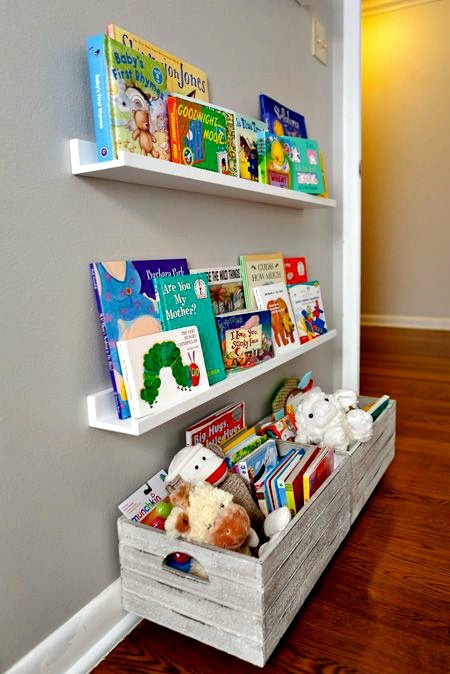 These little shelve units are gorgeous. Surely they would make tidying away toys fun! At least you'd think so! More over-the-door storage solutions here. 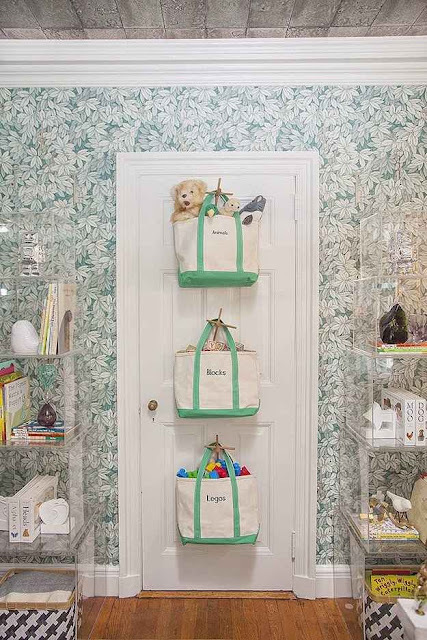 I especially love the see-through shoe bags -perfect for arts and crafts stuff, like in the picture, but I can also imagine putting Becky's Barbies in there. 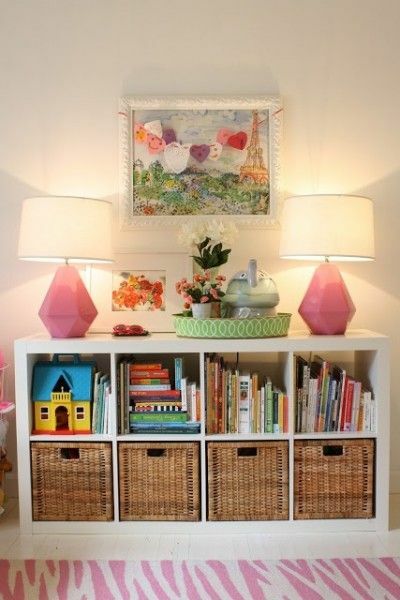 The storage cubes and toy box are so cute, too, though, aren't they? 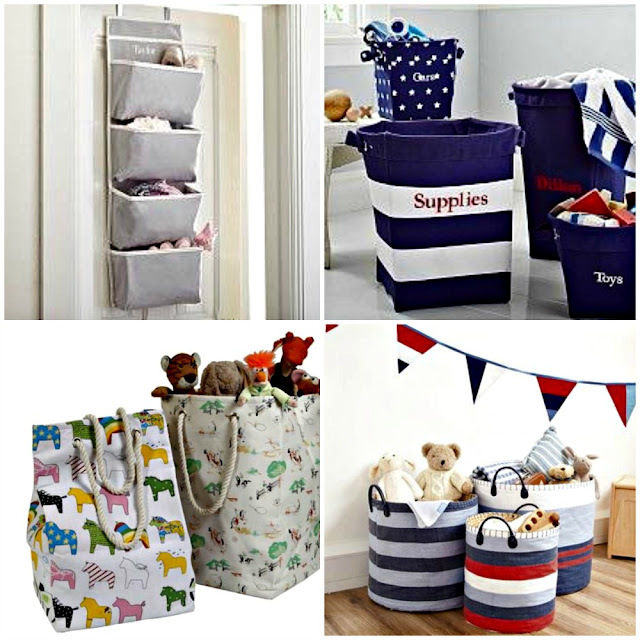 These super sweet storage baskets are also super cute, and would not look out of place in any room. Putting them on my wishlist right now.